A study on plant diversity and community analysis was conducted between October 2014 to September 2015 with the objective of documenting plant species diversity together with the status and trends of biodiversity change. Common ecological methodologies and techniques were applied. Aerial photographs using Google earth and ground survey using GPS, compass and clinometers supported by ArcGIS based mapping was done to identify the clear distinction between vegetation and habitat heterogeneity before vegetation sampling. R statistical Software was used to run cluster analysis and ordination. Four plant community types were identified in the study. The Shannon-Weiner Diversity index was calculated to see the overall diversity of the study area. The area is with relatively high plant species diverse at H’= 3.37 with overall species evenness, J= 0.61 confirming the fact that Shewa floristic region is among the most species rich habitats. Ordination results showed that the major environmental variables structuring the floristic composition and plant community types and altitude was found to be the most influential factor at 95% confidence interval (P=0.005) using Canonical Correspondence Analysis. Comparison of historical records from literature and practical observation of the current status of the study area confirmed that there is an increasing trend of biodiversity and vegetation cover. This is justified by observing the positive impacts of the project centre for indigenous trees propagation and biodiversity development for Ethiopia located at Tulu Korma. The study showed that the area is rich in plant species and floristic composition, hence, experiences adopted by the Project Centre should be the lessons learned for the restoration and rehabilitation of similar environments. Fig. 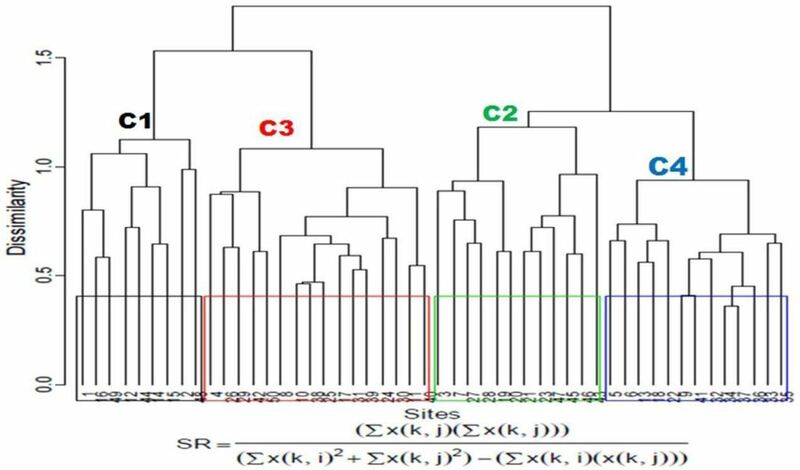 : Agglomerative Hierarchical Cluster Analysis using similarity ratio (SR).